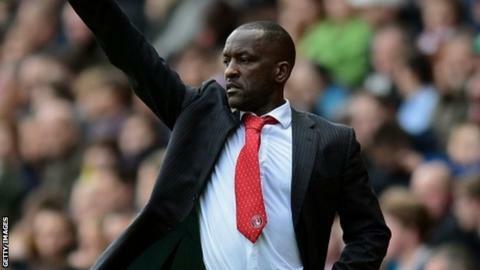 Charlton manager Chris Powell says the lack of new deals for players and staff who are out of contract next summer is causing "uncertainty" at the club. Powell's own contract also expires at the end of the season. "Hopefully we'll be in a position to give them the rewards I feel they deserve. "There's an uncertainty there. I'd like the players and squad to be sorted, and my staff. "Being manager and leader of the football club, I would like them to be happy before I look at myself," he told BBC London 94.9. "I just have to play it day by day and see where it takes us but I'm not in a position to effect that at this present time. Despite his concerns, Powell is not worried performances will suffer. "It hasn't affected their work," he added. "They've been giving their all, as always, for me, each other and for this football club. "It would be nice for me for me to be in a position to get that done. When that times comes no doubt I'll be doing my best to persuade those boys to commit themselves to this club." Skipper Johnnie Jackson is among those hoping to be offered new terms after arriving at The Valley in 2010. "Johnnie, being captain, is keen to continue his career at this club but there's a number of others who want to do the same," Powell said. "In January, they've got six months left and that's not a good position for us to be in because they're assets to this club. "They're assets from a business point of view but the first port of call for me is the football - and they're good players. "I suppose all they can do is play well, show everyone that they're ready to give their all in every game and then hopefully we'll be in a position to give them the rewards I feel they deserve."